I recently gave a lesson on "Calvin the Christian Humanist" at my local church. The lessons was well received but the study time leading up to the lesson was more profitable to me. One books that was largely profitable in my study was William C. Innes's Social Concern in Calvin's Geneva. I'd like to highlight a couple sections of the numerous chapters in this book. "Many of Calvin's theological ideas on social ware for welfare and economic activity admittedly reflect the concerns in outlook, the morality and piety, found throughout the European cities of the late Middle Ages…He was essentially the first major theologian of this era to grasp the actual mechanism of economic processes and to grapple with the interrelation of secular economic development in the material and moral welfare of the individual. According to Innes, it's not the social ideas of Calvin that are innovative but his coming to grips with the actual issues of the individual in Geneva. 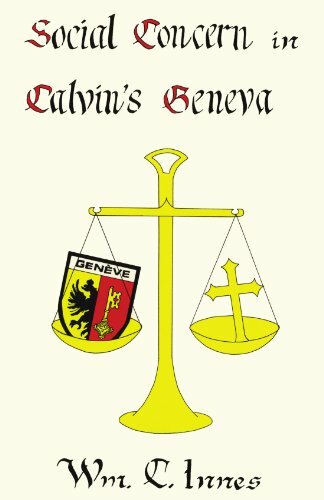 This concern about the local people of Geneva is what causes Calvin to stand out and warrant a thesis study of the social programs and reform implemented by Calvin and the Geneva City Council. As I slowly make my way through pieces of Innes's work, I think it will become abundantly clear that many representations of what Calvin did in Geneva are woefully tainted with disrespect and cluelessness. Calvin's profound concern for the social welfare of the people—and the role it plays in the communication of the gospel—cannot go underemphasized.